This is the 19th square of the 30 square Knitterati Afghan. The afghan commemorates Cascade Yarns® 30th anniversary. The 30 squares will be released throughout 2017 as a mystery knit-along. Cascade Yarns® will be making a donation to Warm Up America! equal to the amount that it receives from Ravelry for the sale of this pattern. Warm Up America! is a 501(c)(3) charity made up of volunteers who knit or crochet afghans and clothing for those in need. Founded by Evie Rosen in the early 1990s, in order to help out her neighbors who could use and appreciate the charity of a warm afghan. Warm Up America! has grown from a small Wisconsin charity to a national one, where it distributes tens of thousands of afghans, caps and other items to a variety of US based social service agencies, such as homeless shelters, battered women’s shelters, American Red Cross chapters, veterans homes, senior centers, and hospices. 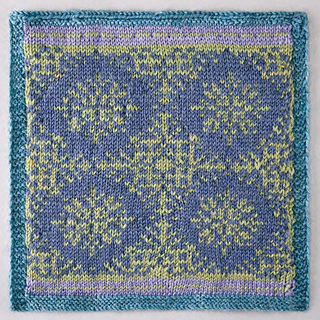 A quadrant of snowflake motifs knit in an updated color palette. 26 sts x 32 rows = 4” (10 cm) over Stockinette Stitch using size 5 (3.75 mm) needles. For additional tips and helpful videos for this square visit: Cascade Yarns® Block 19 Project Page.